On the margins of the fifth biennial review of the UN Global Counter-Terrorism Strategy, the Global Center hosted a closed-door roundtable discussion on Thursday, 30 June 2016 to share initial findings from its report, “Blue Sky III: Taking UN Counterterrorism Efforts in The Next Decade From Plans to Action.” Member state representatives based in New York, as well as capitals, were invited to share reflections on the key issues addressed by the review as well as on the role and impact of the United Nations on international and national counterterrorism efforts. Also on Thursday, 30 June the Global Center partnered with the International Centre for Counter-Terrorism (ICCT) and the Organization for Security and Co-operation in Europe (OSCE) to co-host a side event on “National Action Planning on Preventing and Countering Violent Extremism: Mechanisms and Lessons Learned.” The event, sponsored by the Permanent Missions of the Netherlands, Nigeria, and Kenya, brought together a panel of experts to share national and regional experiences in designing and implementing strategies to prevent and counter violent extremism with views from Nigeria, Kenya, Somalia, and the Balkans being presented. Speakers included Bibi van Ginkel, Senior Research Fellow, ICCT; Edward Flynn, Senior Human Rights Officer of the UN Counter-Terrorism Committee Executive Directorate; Alistair Millar, Executive Director, Global Center; Thomas Wuchte, Head on Anti-Terrorism Issues, OSCE; and representatives of the Republic of Kenya and Nigeria. Speakers underscored the importance of localization, inclusivity, and sustainability in the development of any national countering violent extremism strategy and emphasized the need for adequate training and funds to ensure successful implementation. Moreover, the critical role of civil society in supporting and complementing national efforts was underscored by several speakers and members of the audience. On Friday, 1 July, Naureen Chowdhury Fink, Head of Research and Analysis, Global Center moderated the side event “International Youth Engagement to Prevent and Counter Violent Extremism,” organized by the Permanent Mission of Norway to the United Nations together with the Youth Civil Activism Network (YouthCAN). The event, brought together a diverse group of young activists who shared innovative ideas and ways to challenge extremist narratives, for example, using technology, new media, humor, and children‘s books. 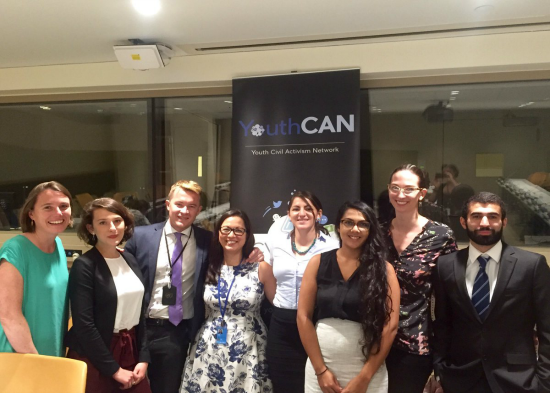 YouthCAN is a network that elevates grassroots efforts to counter violent extremism by bringing together activists from different fields including entrepreneurs, artists and students. Ms. Chowdhury Fink underscored the critical need for such cutting-edge efforts to address violent extremism, particularly by young people who are close to their communities, understand the threats and challenges, and can develop resonant and engaging responses.